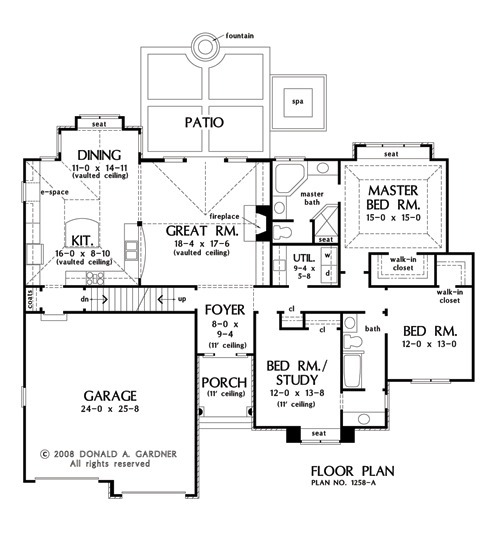 With an enchanting Craftsman styled exterior and an efficient floor plan, the Greenbranch is a versatile house plan. The shed dormer and copper roof accents add eye-catching appeal while the covered front porch provides protection for visitors. 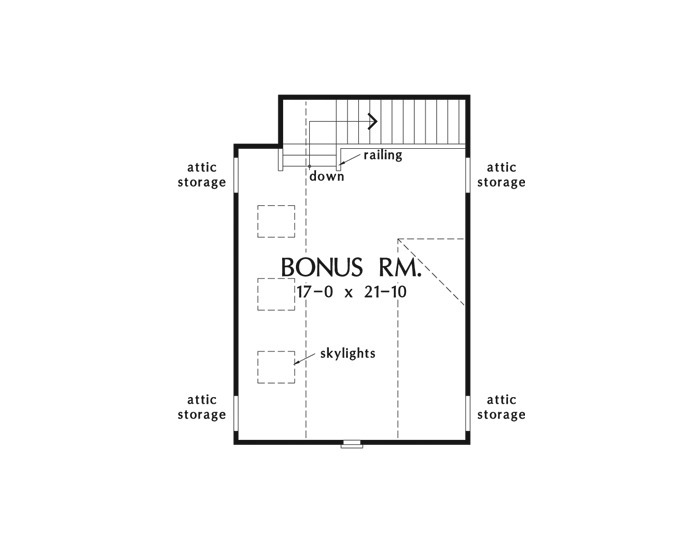 The highly efficient floor plan boasts an open great room with vaulted ceiling and no wasted space. The spacious kitchen with large island provides easy access to the dining room with a built-in window seat while the vaulted ceiling adds an airy feel. A centrally located utility room makes laundry chores easy. The cozy master suite features another window seat, large walk-in closet, dual vanities and a spa bathtub. Two secondary bedrooms are joined by a hall bathroom with separate sinks. The bonus room above the garage awaits expansion and welcomes natural light through 3 large skylights. 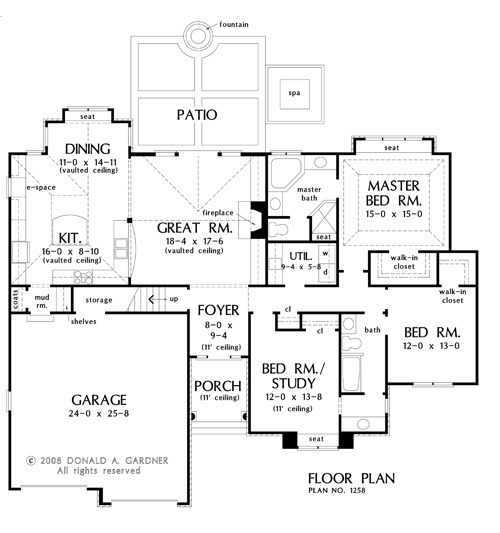 House Dimensions: 64' 0" x 54' 0"
Great Room: 18' 4" x 17' 6"
Bedroom / Study : 12' 0" x 13' 8" x 11' 0"
Bonus Room : 17' 0" x 21' 10" x 10' 0"
Dining Room (Vaulted): 11' 0" x 14' 11" x 15' 3"
E-Space : 5' 0" x 8' 10" x 9' 0"
Foyer : 8' 0" x 9' 4" x 11' 0"
Garage : 24' 0" x 25' 8" x 0' 0"
Garage Storage (Sloped): 7' 6" x 3' 4" x 0' 0"
Great Room (Vaulted): 18' 4" x 17' 6" x 18' 7"
Kitchen (Vaulted): 16' 0" x 8' 10" x 15' 3"
Master Bedroom (Tray): 15' 0" x 15' 0" x 11' 0"
Mud Room : 5' 10" x 3' 4" x 9' 0"
Patio - Rear : 18' 4" x 15' 10" x 0' 0"
Porch - Front : 8' 0" x 8' 8" x 11' 0"
Utility Room : 9' 4" x 5' 8" x 9' 0"